Despite sunshine resuming by late Tuesday morning, winds will increase dramatically through Tuesday afternoon. As promised, we saw a few rounds of showers and light thunderstorms pass through New Jersey overnight. The ensuing cold front — the leading edge of a cooler, drier air mass — is taking its sweet time in getting here. Once it arrives by late morning, we'll see the rain end and skies clear to sunshine. It's also going to get quite windy from midday through the afternoon, with potential gusts to 40 mph. Meanwhile, temperatures should remain fairly constant all day, on either side of 70 degrees. Tuesday night will be breezy and cool, with continuing mostly clear skies. Low temperatures will be seasonable, near 50 degrees. Reinforcing shots of cooler air will push thermometers downward through the rest of the week, with below-normal temperatures expected for the rest of the week. Wednesday will start sunny, with clouds taking over the sky by the afternoon. It'll remain a bit windy, with gusts to 30 mph. High temperatures will be limited to the lower to mid 60s. Thursday gets even cooler, with highs in the lower 60s at the warmest. 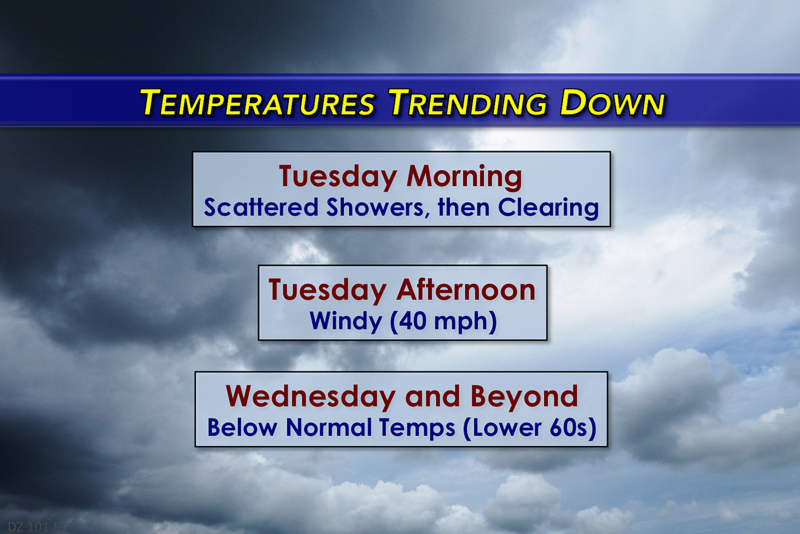 Clouds will progressively increase throughout the day as our next storm system approaches. A shower will be possible as early as Thursday evening's commute. Our next storm system is going to produce an extended period of steady to heavy rain, to close out the workweek. Models are in disagreement regarding the start time of the rain. The NAM says showers begin Thursday late afternoon, with steady rain spreading through New Jersey starting just before Midnight. On the other hand, the GFS puts first drops over New Jersey just after Midnight Friday morning, with steady stuff throughout the day Friday. We'll have to see how the timing forecast evolves through the rest of the week. For now, just know that your Cinco de Mayo is looking wet. And windy too, with wind gusts again in the 30 mph neighborhood. High temps for Friday and the first weekend of May will hold steady in the lower 60s, about 5 to 10 degrees below seasonal normals. Saturday will bring more clouds and a chance for showers. Sunday looks a little bit brighter.